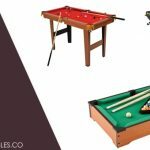 Tornado Foosball Tables Reviews : After a Brief Guide on Human Foosball, Today Here We are Sharing a Small Review of TOP Tornado Foosball Tables to Buy in 2019. 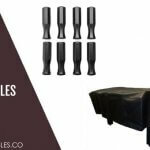 #1 Why You Should Buy Tornado Foosball Tables? Foosballs tables are great sport when it comes to family get-togethers and hanging out with friends. When we think about the most popular tornado tables in the market, the names surfacing is — Tornado, Cyclone, Coin OP, Warrior, etc. among others. Of course, all of these are amazing, but it cannot be ignored that Tornado tables are the longest standing and the most loved in the market. They are more durable and even though their prices go a bit higher, their looks and functionality beat all others in the competition. Made up of Mahogany wood with a Melamine finish on a 1″ thick cabinet, this table has looks that can make you look twice. It has adjustable legs with boot levellers, hence its height can be altered as and when required, and that too without much hassle. It consists of SureGrip plastic handles black in colour, which look elegant and enhance the beauty of the table design. End ball return feature makes the game play smoother and faster. It is U.S. built in Richland Hills, Texas. 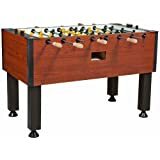 Like the previous one, this table is also made up of Mahogany wood with a Melamine finish on a 1″ thick cabinet with the looks of some vintage foosball table. It has adjustable legs with boot levellers so that its height can be adjusted instantly. It has SureGrip black plastic handles that enhance its exteriors. It also has End ball return feature for a better game play experience. It is U.S. built in Richland Hills, Texas. This foosball table is a three-goalie foosball table and it is based on the single-goalie practice table by Tornado. It has Patented Tornado men, which have been improved with corners that are sharper and cross section that is increased, for better controlling and passing of the ball. It includes thin-wall split Competition bearings, which allows for greater controlling and shot blocking. This table is rugged styled with Stainless steel that is laminated, with bold logo graphics and durable end protectors. It includes split cabinet design with top having a full-access. It has 3/4″ of Playfield area. It is U.S. built in Richland Hills, Texas. 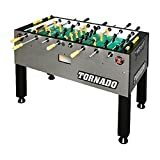 This tornado table is one of the most purchased Tornado foosball tables on Amazon. It includes a 1-Man Goalie and has unique Banked Corners. 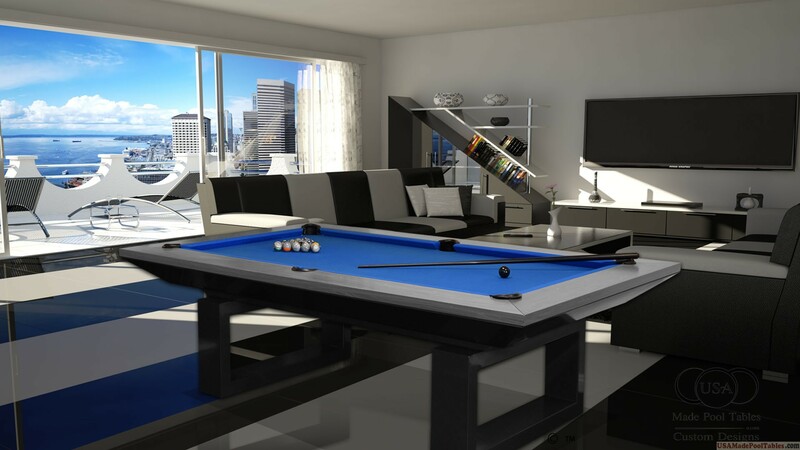 It is built on a 1 1/2″ Stainless Steel laminate cabinet, which gives the appearance of a perfect modern foosball table with all its oh-so-cool looks. The steel rods included in this table are brushed and of commercial quality. They are .156 thick. They are claimed to be capable of withstanding some of the most abusive game plays. It includes counter-balanced men with an intention of enhancing the gameplay experience. It is constituted of Split Bearings, making the table more durable so that it lasts longer. This Tornado table has a Victorian Cherry Laminate finish, built on a cabinet, which is 1 1/2″ thick. It has commercial grade leg levellers, which can be adjusted according to the requirements of the players. It has handles made up of Natural solid wood, enhancing the overall durable design and glamour. It includes the popular patented Tornado Bumpers and men created keeping in mind a better quality of game play experience. It is U.S. built in Richland Hills, Texas. This foosball table has a dual-tone black and maple design, which flaunts its classic look and makes up for a great add-on to your interiors. It has a 1.5-inch thick fibreboard cabinet of medium density. Assembled Dimensions is 56 L x 30 W x 36 H inches. Weight is 350 pounds. It includes the patented urethane textured foosballs, which enhance the game play experience. This table includes adjustable leg levellers of commercial grade for durability and toughness. 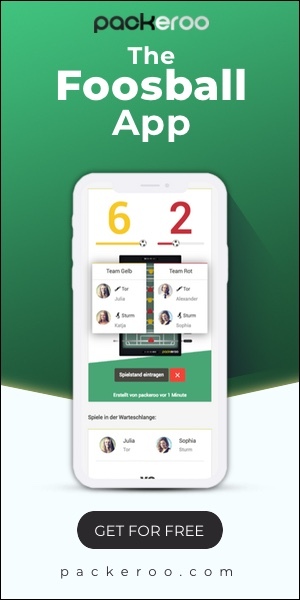 It is designed with a three men goalie and a smooth playing surface with the dual side-ball return feature for an amazing gameplay experience. The solid football handles are made up of natural wood. A heavy-duty steel rod with a hollow centre makes them lighter and faster. Tornado foosball table are the best choice according to the needs of today’s youth. They come in sleek and stylish designs, blend well with the home furnishing, add beauty to the interiors and facilitate a smooth game play. Tornado tables have been in the markets since 1900s and have withstood the heavy competition from other similar brands. Next article Where to Find Foosball Table Parts? 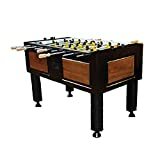 I just bought tornado foosball table for my family & really appreciate your review. Thank for sharing. Thanks for Your Feedback ! Keep Coming !